When the clowns began to surface, many guessed they might be part of a guerrilla marketing campaign for a horror movie. Now, after a summer of sightings, several clown-related threats, robberies and close encounters involving children have law enforcement and communities across the country on edge. Some of the first clown sightings began back in June and August, stretching from the Midwest to the East Coast and through the south. In Wisconsin, Gags the Green Bay Clown gained viral status after grainy photos of a clown surfaced walking the streets under the cover of night. Speculation was that Gags and other clown sightings might be related to a viral marketing campaign for a movie, haunted house or other entertainment product or venue. Another report in South Carolina said a clown was spotted trying to lure children into the woods. The sightings took a scary turn in mid-September, when three children in Georgia told police about an incident involving two adult men dressed as clowns. McDuffie County deputies say Cameron Frails, 12, and his little brother were walking to a bus stop after 6 a.m. when they were chased by men donning all black clothing, clown masks and red wigs. The neighbor girl, Hannah Rice, saw the clowns following the boys out from between two mobile homes before the chase, deputies said. A week later, police in Pottsville, Pennsylvania began investigating a frightening claim by a 12-year-old who said she was chased by a clown through a park. Brianne Hawke, 12, told WNEP-TV that a little boy came screaming through the park after allegedly seeing a group of clowns "eating something in the woods." "A clown started chasing us up here and turned around and went back to the woods," she said. But the terror wasn't over. The alleged clowns returned, she said, throwing sticks at the children before hurling curse words at them. "It was scary," Brianne says. 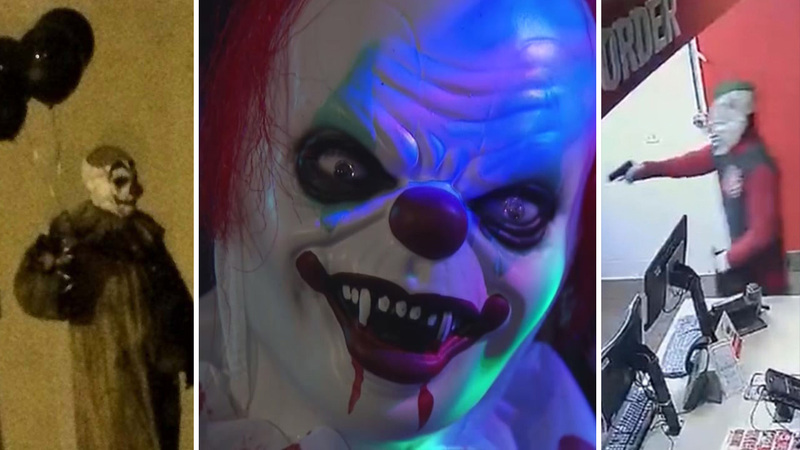 After alleged clown sightings in South Carolina, southern Kentucky, Tennessee and a few other states, the Tennessee Highway Patrol issued a warning to parents to watch the kids and to be on the lookout for anything out of the ordinary. The threat, they said, was the possibility of predators in clown costumes seeking to lure children into the woods. Around the same time, law enforcement said a teenager in Coffee County, Tennessee claimed to have been attacked by a clown. All the while, retail shops across the U.S. began rolling out Halloween costumes including an assortment of clown-related costumes, wigs, makeup and accessories. Arizona officials blame an abnormal number of school absences on a social media threat featuring a clown image. Between two Phoenix school districts, 24 schools were named in a multitude of threats posted online. Parents and students were shaken, with about half of the 3,000 students at Marydale High School skipping class out of concern. Three juveniles were arrested after the FBI joined the investigation. They face felony charges, but law enforcement said they believed others may be involved. Later in the week, schools in Ohio and Tennessee would be targeted by similar clown-related threats. The next day in Phoenix, police say two different fast food restaurants were robbed by suspects wearing clown masks. Around 8 p.m. Tuesday, a Taco Bell restaurant was allegedly hit by an armed robber. As police were busy investigating, the suspects allegedly hit a Domino's restaurant nearby. Two 17-year-olds were arrested in connection with the robberies. Several 911 calls in Long Island, New York were recorded in regards to clown incidents. In one call, drivers reported a group of clowns were jumping in front of moving vehicles in Brentwood. No one was arrested after the incidents.